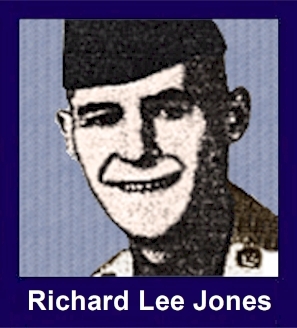 The 35th Infantry Regiment Association salutes our fallen brother, PFC Richard Lee Jones Jr., who died in the service of his country on September 27th, 1968 in Quang Duc Province, Vietnam. The cause of death was listed as Small Arms/AW. At the time of his death Richard was 21 years of age. He was from Wichita, Kansas. Richard is honored on the Vietnam Veterans Memorial at Panel 64W, Line 11. The decorations earned by PFC Richard Lee Jones Jr. include: the Combat Infantryman Badge, the Bronze Star, the Purple Heart, the National Defense Service Medal, the Vietnam Service Medal, the Vietnam Campaign Medal and the Vietnam Cross of Gallantry with Palm Unit Citation. Services were pending Tuesday for Army Cpl Richard L Jones, 21, of 3137 S Yale, who was killed in Vietnam. Jones was born in Eiko, Nevada and moved to Wichita from Sallisaw, OK. A 1964 graduate of South High, Jones attended Wichita State University and worked at The Boeing Company before entering the Army in 1967.